Movable, heavy duty temporary fencing for construction projects, crowd control. These fully fabricated fence panel systems are ready to use on any construction site and are delivered quickly to you. Temporary and portable fencing offers protection for pedestrians, limit risks of theft and vandalism on jobsites, is commonly used in or around construction sites for keeping the general public and workers away from construction hazards, there are also a number of other common applications such as fairs and exhibitions, site perimeter fencing at concerts and traffic containment at roads among many others. Our temporary fences are all chain link and pipe is fully welded galvanized steel with the inclusion of the plastic base which is filled with sand or water. Our temporary fencing systems can be easily installed and are strong, durable fitting every environment or weather. During install you don’t need to disturb the surface, dig holes or lay strong foundations. The bases are reinforcement on the top and bottom to ensure maximum strength and durability. Easy relocation is enabled because panels, bases and brackets are easy to erect and handle. At Buyers Barricades we offer competitive pricing and superior site protection. Our services include prompt, reliable delivery and installation on site. We can help you determine the right service for your needs and budget. If you have any questions or would like to get a free quote on temporary fence panels, please contact us today. 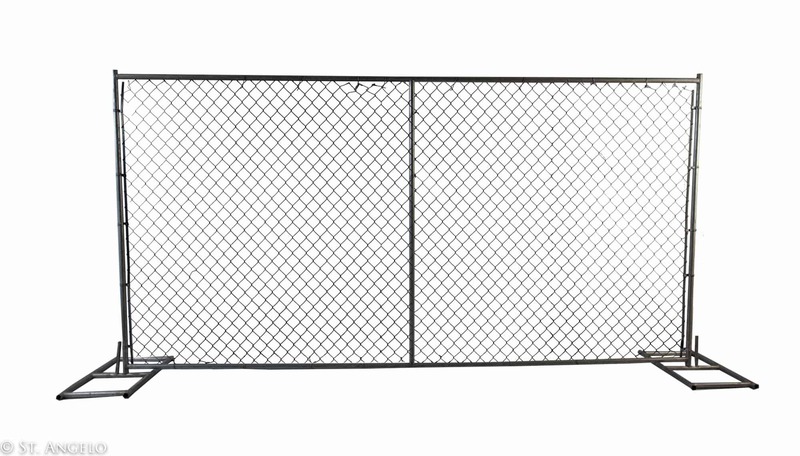 6′ H x 12′ W, free standing fence panel. Sand bags recommended to provide stability.